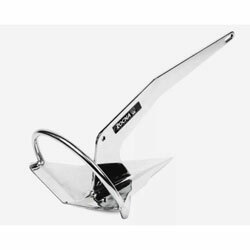 Introducing the Rocna Original Stainless Steel, the ultimate solution to your vessel's anchoring needs. A Rocna always attains its correct setting attitude for quick penetration, regardless of how it hits the bottom. It digs straight in, offers superior holding-power, and will not easily trip out on load reversal. Rocna represents the best in safety, security, and dependability. The Rocna Anchors lifetime warranty has been expanded to include bending or deformation, in addition to breakage. It applies to the lifetime of the original purchaser, when the anchor is sized appropriately for the boat using Rocna's sizing recommendations. Many companies warranty against breakage, but Rocna Anchors is so confident in the Rocna's rugged design that they warranty against manufacturing defects and bending. An anchor is vital piece of safety equipment, and Rocna gives their customers the peace of mind that their Rocna will perform as promised.